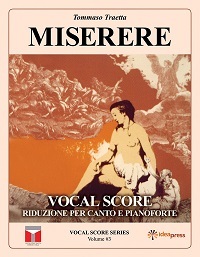 The premiere of the last version: 25 june 2005, at the National Theatre of Opera and Ballet. 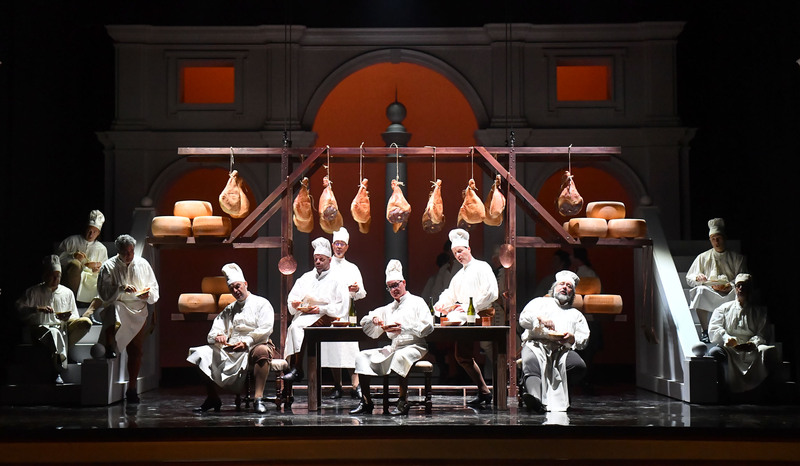 „In theatre exists some moments when the poet and the composer, must have suficiently tact for writing somthing else than lyrics and music”. SYNOPSIS The action takes place in Memphis and Teba in time of pharaoh’s reign. A room in the Royal Palace in Memphis. 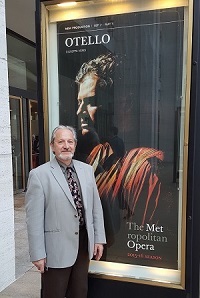 Radames, the Captain of the Guards, learns from Ramfis, the head of the High Priests, that the Ethiopians are threatening war and that the Goddess Isis has already decided on the name of the Egyptian supreme commander who will lead the Egyptian army in confronting the enemy. 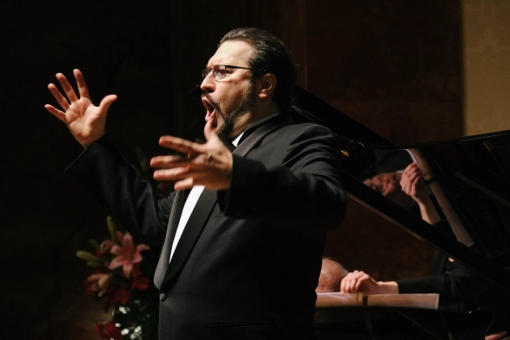 Radames is overjoyed at the news and hopes he will be chosen. He imagines a glorious victory where he is able to return triumphantly to free his beloved Aida, slave of Amneris, the Egyptian King’s daughter. Amneris appears and he tells her of his hopes, with no mention of his feelings for Aida, although Amneris has her suspicions. 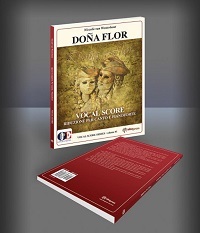 Shortly after, Aida herself approaches and Amneris sees in her eyes the love she bears for Radames. She swears vengeance because she too is in love with the young captain of the guards. In the meantime the King enters preceded by his guards and followed by priests led by Ramfis. A messenger enters bearing the news that the Ethiopians have invaded Egypt and are marching against Thebes, led by the mighty warrior Amonasro. The King announces that Isis has appointed Radames supreme commander. The crowd cries out in homage to him, while Amneris punctuates the choral song with a languorous appeal for her warrior to return in victory. 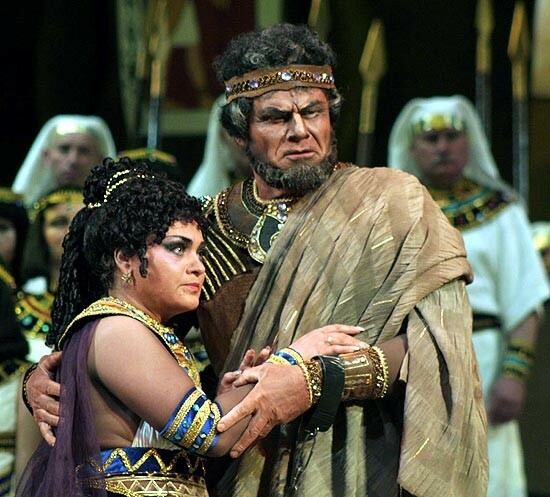 Only Aida is sad since the victory of Radames, whom she loves, must mean the defeat of her father, the King of Ethiopia, who has taken up arms to free her from slavery. In this moment of distress, she calls upon the gods to have pity on her. Inside the temple of Vulcan in Memphis. The priests and priestesses sing a hymn to the gods. Radames enters dressed for battle, receives the sacred sword and is consecrated to Ftha to protect him in war and to direct him towards victory. A room in Amneris’ private apartments. The King’s daughter is surrounded by her slaves who are dressing her for the triumphal Egypitan festivities, while young Moorish slaves perform a dance. When Aida appears, Amneris hides her true feelings and sympathizes with her for the fate of her people, defeated in the battle. Then, to discover whether Aida is, in fact, in love with Radames, she tells her that he has been killed in the battle. 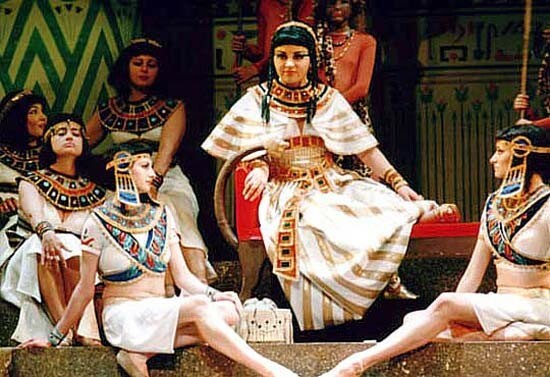 Aida is stricken with grief; Amneris confirms her suspicions and filled with rage, reveals the truth. Radames is alive and she, Amneris, loves him too. At first Aida proudly declares her love, but then begs in vain for pity. Amneris threatens her, reminding her that she is only a slave and cannot hope to compete with a daughter of the Pharaohs. At this point, Aida is about to reveal her royal identity but decides against it. 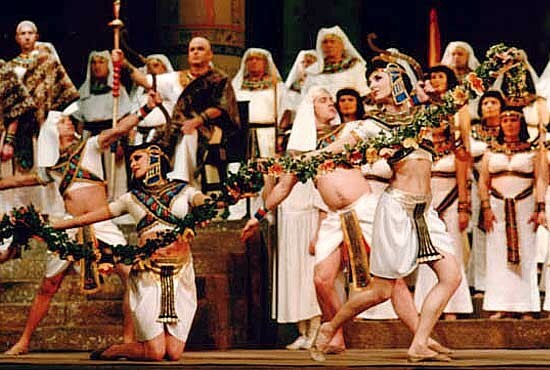 The population celebrates the victory, whiles the King and Amneris, together with Aida and other slaves, the ministers and priests, are waiting Radames to celebrate his triumph. A column of soldiers and prisoners arrives, with Radames at its head. The King welcomes him and asks him what he would like as a reward. Radames has the prisoners brought before the King. Among them Aida recognizes her father Amonasro and succeeds in speaking to him briefly. He commands her not to betray him, and, without revealing his true identity, both Aida and her father beg for his mercy. 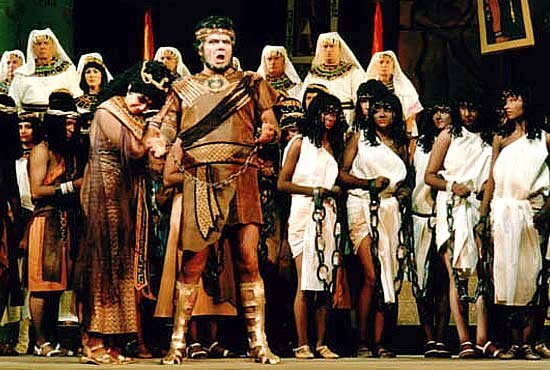 Radames also pleads that all the prisoners be freed, but the high priest objects and proposes that at least Aida and her father be held in Egypt, as a guarantee of peace. The king approves this suggestion and announces that he intends to reward Radames by bestowing the hand of Amneris upon him. 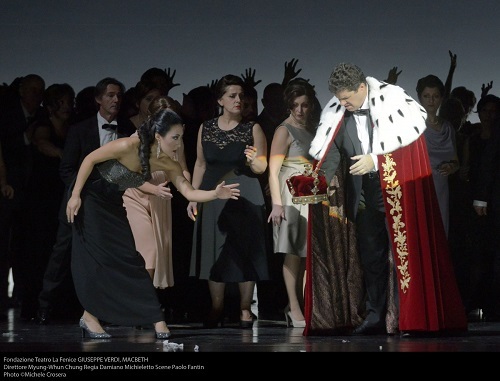 While the crowd cheers, Radames and Aida secretly express their sorrow. Night on the banks of the Nile. At the temple of Isis Ramfis leads Amneris to the temple to receive the goddess’ blessing on the eve of her wedding. 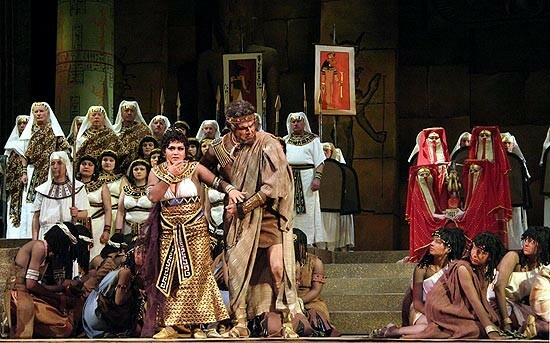 Concealed nearby, Aida awaits Radames for their secret encounter, but while she is waiting Amonasro appears. He has discovered the emotions Aida and Radames feel for each other. 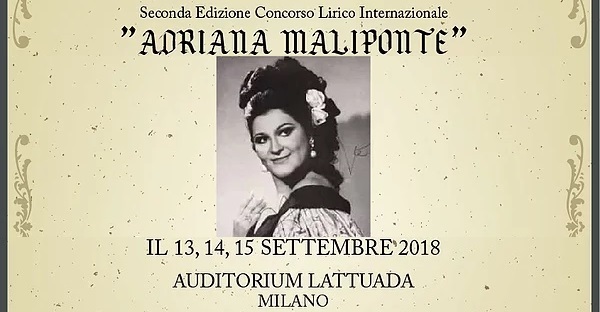 He reminds Aida of the beauties of her native land, and the cruelty of their enemies and urges her to persuade Radames to reveal the route the Egyptian forces will use to invade Ethiopia. Aida is horrified at his suggestion. 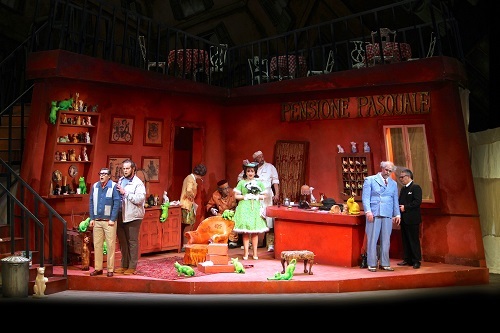 Then Radames approaches and Amonasro conceals himself. 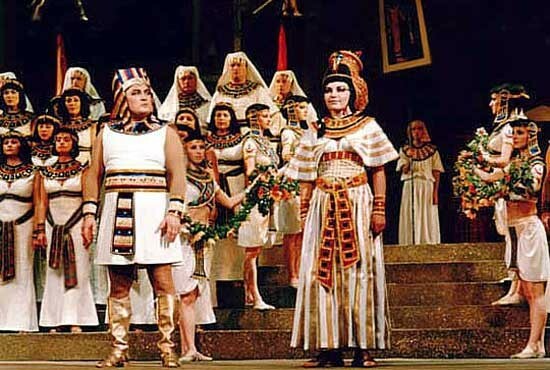 Aida proposes to Radames that they flee from Egypt, following some secret route unguarded by the Egyptian forces. Radames agrees and then Aida questions him on the route his army will take into Ethiopia. Radames mentions the gorges of Napata and at that moment Amonasro reappears and reveals his true identity. 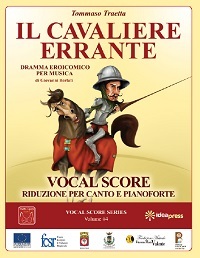 Radames is horror-stricken; for he realizes that he has revealed a military secret and is dishonoured. 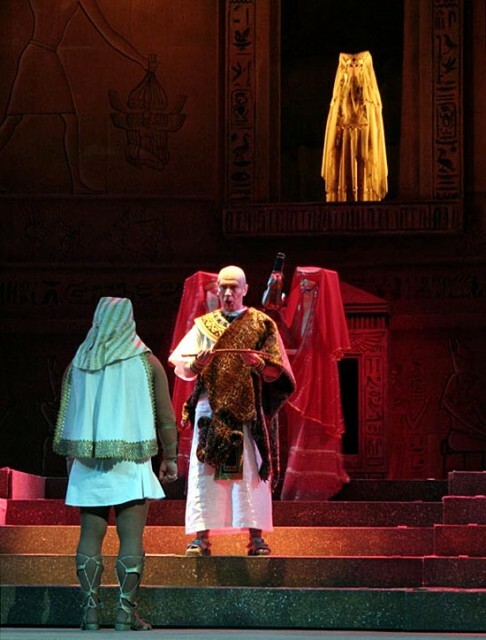 At this point Amneris arrives from the temple and cries out at the betrayal. Amonasro seeks to kill her but Radames prevents him, and surrendering his sword to Ramfis, allows him to be taken prisoner. Amonasro escapes with Aida. A room in the King’s Palace. Amneris is torn between rage, sorrow and love. She wants to save Radames and has him brought before her. She asks him to plead not guilty before the High Priests to his conviction of being a traitor. In this way she can help him. He refuses. 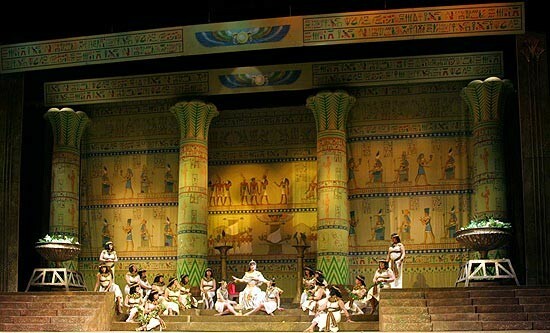 To convince him, Amneris has him believe that Aida is dead along with her father Amonasro. This does not dissuade him as now life holds nothing more for him. 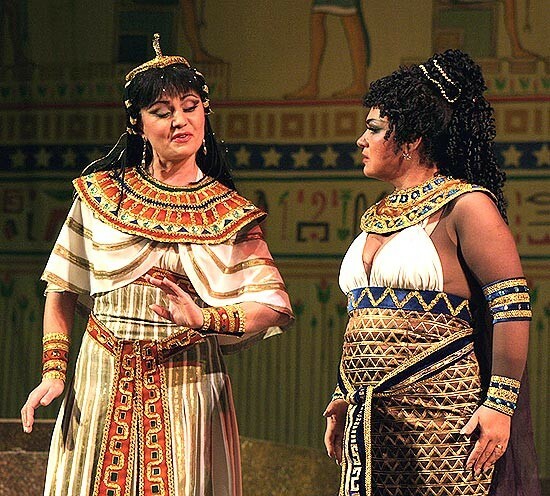 Finally, Amneris reveals that Aida is, in fact, still alive. This revelation precipitates rejoicing by Radames that he can now die to protect his beloved. 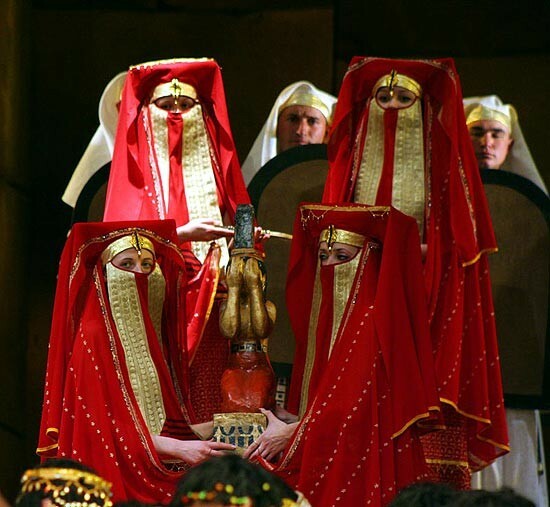 However, Amneris declares that she will implore the King to pardon him if only he will renounce his love for Aida. He repeatedly refuses. He is consequently taken back to the dungeon and sentenced to be buried alive under the altar in the temple of Vulcan. 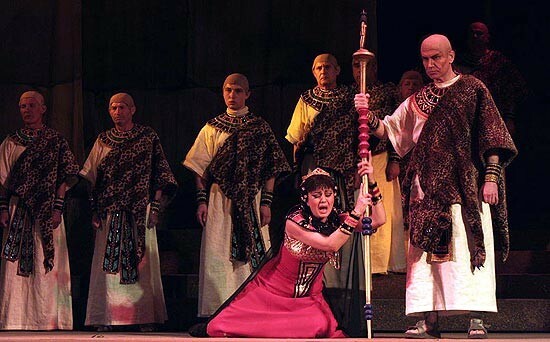 Amneris bitterly deplores the cruelty of the priests and their punishment. In the Temple of Vulcan in Radames’ tomb. 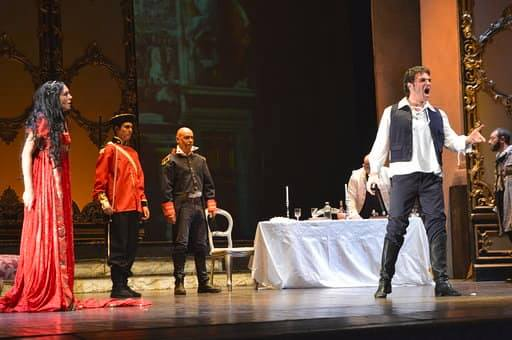 Radames is ready to die and prays that Aida will be able to find happiness one day: but Aida is concealed in the chamber and comes forward to embrace him. 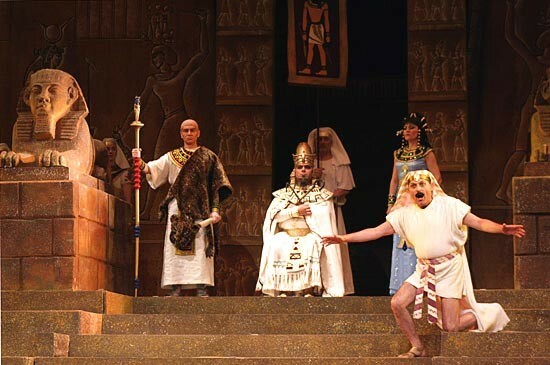 Radames laments Aida’s harsh fate, and vainly tries to dislodge the stone that seals the tomb. But Aida consoles him with the certainty that the ”angel of death” will unite them forever and appears to be already speeding to a celestial haven. While the two lovers bid farewell to the Earth, Amneris clothed in mourning robes, prostrates herself on the stone covering the entrance to the vault and beseeches the gods to grant peace to the man buried below. 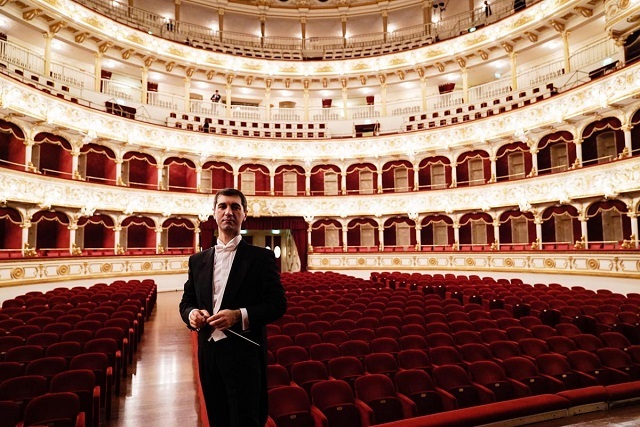 This entry was posted in OPera and tagged Aida, Giuseppe Verdi, Moldova. Bookmark the permalink.